I couldn’t trace where the black wires connect to or from at first, and I got that bundle of black wires mixed up with the one I’ll be talking about below. One thing is for sure: one should not judge the wires by their color too quickly. The fact these are black vs red does not mean they are both -/+ parts of the DC / DCC bus. They could all be the neutral or the hot of the bus, no matter what their color is. I obviously have a theory of why this is setup that way. I need to crawl again the layout and trace a few more bundles of wires before being sure. On the left above is one of these bundles of red wires from that interconnection board above. It just wraps around and has been cut. 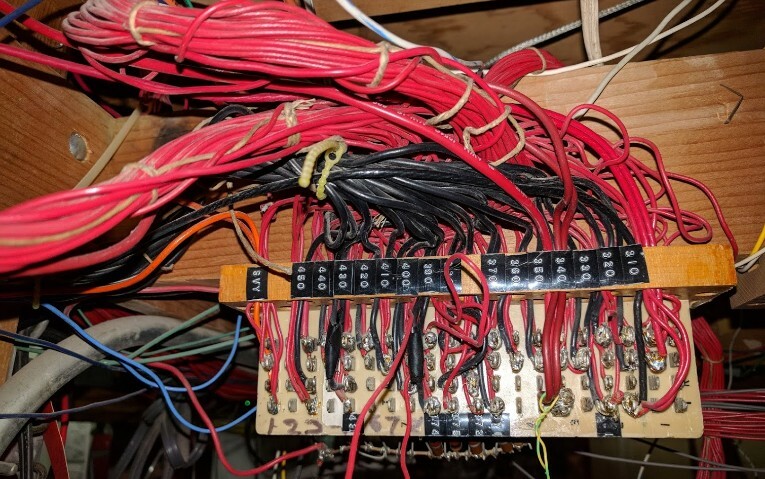 The whole interconnect board is such a mess that I’m afraid of even trying to remove these obviously unused wires. Next picture shows the bundles of black wires. I traced the bundle going all the way to the back room of the layout -- we’re talking 40-50 feet away, then connect to a bundle of purple wires which go back in the reverse direction -- along the bundle of black wires for a while, except from time to time they split off and end up connecting to some red wires (but not the ones from above). 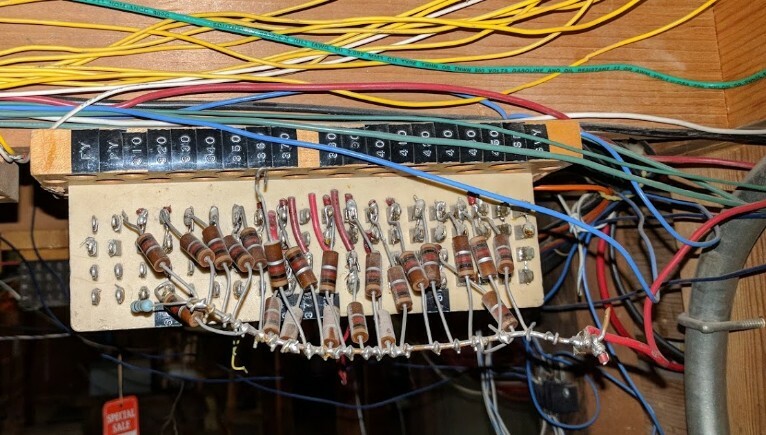 Tracing those red wires ended up fruitless on several occasions. So what does all that stuff do exactly? “Well, those resistor are so old they could also be 10kΩ… [...] it predates my work on the layout… but I think I do know what they are for. The train detection system on the layout in DC days used the venerable Twin T track detectors powered, I think, with a 27V subsidiary supply. 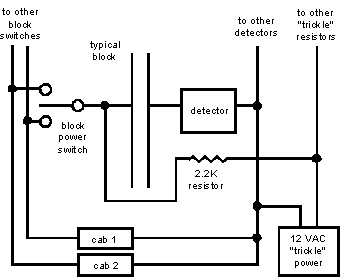 [...] The Twin T system used a current detector circuit much like the attachment here so the detector would register track current being drawn with a train in section. The only problem with it was that a stationary train in DC does not draw current so a standing voltage bias was applied to each block on the rail on one side through a bias resistor and the detector lurked in the return rail. That meant a stationary train would always register. So should we keep the resistor? What about these bundles of cables going to the back room and then back to the Mountain division?